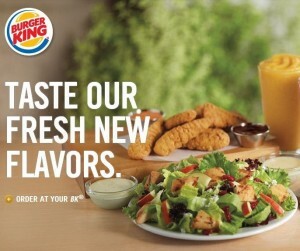 Burger King is creating a good amount of marketing buzz around their new menu and the experience that consumers will have. They have redeveloped their menu, which is somewhat reminiscent of McDonald’s to be more health conscious by adding salad and wraps options. They will somehow be incorporating a touchscreen into their point of sale and using food trucks to get their product out to the masses. What is their marketing strategy here? Here are some takeaways from the whole concept. Track your sales. For a big company to shift like this means that their stores aren’t performing as well as they hoped. John and I are adamant about tracking sales dollars and quantities and as Burger King probably has been losing share to competitors, they hope to get it back with this new product launch. Track your sales so you can make marketing programs to tackle a downturn. Get people in your door. Any type of retailer knows that if they can get you in their door and on their grounds, they can probably sell you something you did not want to buy, eat, or have. Give them a reason to come by – like Taco Bell and the Locos taco, Burger King hopes to create a new customer experience. Test your product. With the food truck, Burger King plans on sampling the new product to the masses before they actually release to stores. How can you do the same? Test your market before you assume that everyone will love your product or service. You might be liked be everybody because you smile, but that does not mean you know what everyone likes to smile about.